The Devonian Period of the Paleozoic Era lasted from 417 million years ago to 354 million years ago. It is named for Devon, England where the old red sandstone of the Devonian was first studied. During the Devonian there were important changes in the land masses on the globe. North America and Europe had collided forming a large continent called Euramerica. This caused the formation of the Appalachian Mountain Range. The other large land mass was Gondwana. It was made up of South America, Africa, Antarctica, India and Australia. These two large land masses lay close to one another near the equator. The two continents were moving toward each other throughout the Devonian Period. The waterway between the two continents covered a subduction zone. This is an area where one plate is moving underneath the other. Eventually this would mean that the two continents would collide to form the supercontinent Pangea in the Permian Period. That event is more than 64 million years later. Laying so close to the equator meant that the climate of the Devonian was warm. The warm temperatures made life on land particularly good for the plants. They developed vascular tissues to carry water and food through roots and leaves. The most important development was the seed. Now plants were not dependent on the presence of water for reproduction and they could move further inland. Ferns and the first trees began to cover the land. The plant-covered lands made a good home for the first wingless insects and spiders. Even a primitive vertebrate, the tetrapod or four-footed vertebrate, developed the ability to live outside the water and move on land. The next development was the fish with jaws, gills and paired fins. The Placoderms were the first fish to have all three of these characteristics. They still had the “shell skin” of the Ostracoderms, but it mainly covered the head and neck area. The largest of the Placoderms was the Dunkleosteus. It was a huge predator in the Devonian seas. It could be as long as 10 meters. Instead of teeth, it had large boney plates that stuck down in the front of its mouth opening. The powerful jaws were deadly to other fish, sharks and even other Dunkleosteus. 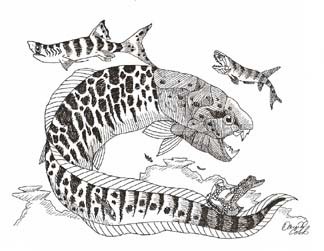 Sharks, or Chondricthyes, developed during the Devonian also. Sharks are thought to be descendents of the large Placoderms, but they lost the ability to form the boney armor on the outside of the body and were unable to form bones on the inside also. Their body is supported by cartilage. Because of the skeletons of cartilage, very little fossil evidence is available. They did leave behind their teeth. Much of the information we have about ancient sharks comes from the many different types of fossil teeth that have been found. Sharks first appear during the middle of this period. The bony fish appear during the middle Devonian Period. The first of these are the lobe-fins. These fish have pairs of fins with fleshy lobes at the base and more typical fin membranes at the ends. The lobes contain jointed bones. These lobe-fins are thought to have evolved into “legs” and eventually into amphibians that spend their lives both in and out of the water. The coelacanth is a lobe-fin fish that developed during the Devonian. For years it was thought to have gone extinct at the end of the Mesozoic Era along with the dinosaurs, but in 1938 a living coelacanth was caught. Since then coelacanths have been seen from time to time in the Indian Ocean. The Dipterus was a lungfish that developed at this time. In many ways it looked like the lobe-fins with bony flesh at the base of its fins. But the Dipterus had lung sacks branching off of its throat that got air from the gills. During the Devonian Period, there were huge swings of floods and drought. During drought times, when lakes turned into ponds, the plants used all the oxygen in the little water that remained. A Dipterus that was stranded in such a pool could stick its head out of the water and get the air it needed to stay alive. The reef building work of the sponges and corals went on through the Paleozoic Era. They built some of the largest reefs in the world. Invertebrates grew well in Devonian seas too, so many new species developed. The ammonite is one of these. Species had begun to branch out and include both land and water habitats. The Devonian Period ended with a mass extinction. The Devonian extinction hurt the water habits much more than those on land. The sponges and corals were the most affected. No major reef building happened again for thousands of years.